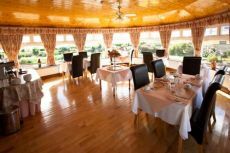 Enjoy the views of 50 miles while overlooking the Atlantic Ocean to both Courses of Ballybunion. From the River Field to the Cashen Estuary to the Cashen Course at Ballybunion Golf Club to the World Famous Old Course. Then looking out to sea - Kerry Head and the Atlantic Ocean looking into the Town of Ballybunion is just breath taking all while you have deluxe choice of breakfast at the Tides Guesthouse in Ballybunion. In the morning of summer the Horses running accross the beach is a wounderful sight of the pony trails enjoying the morning Air as you enjoy the coffie and prepair for the days events.